I took the kids out to take pictures in the leaves a few weeks ago. These are a few of the pictures I got of the Boston Temple near our house. When we first moved to Boston, Johnny asked the members of our ward (strangers who were kindly moving our furniture and stuff into our house for us) where the temple was. Little did we know, it was just up the hill. I've really grown to love the Boston temple and it is my favorite part of the drive to church and the drive up Route 2 (a major freeway by our house.) The temple sits on the 2nd highest hill in Boston and the members of the church here have lots of miraculous stories about how it was finally built. 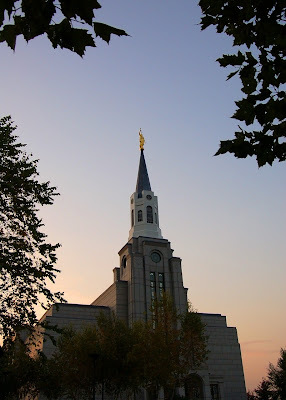 It's become one of my very favorite temples. Beautiful, isn't it!! WOW!! These really are great pictures. Maybe in all your spare time you should open a studio. :) I know I am hillarious! Em, you're right, this temple is beautiful. The steeple is really pretty. oh it is beautiful! how wonderful to have it so close! Great Pictures!! I love how you framed the Temple with the leaves. You really have a knack for this photography stuff. It so beautiful!! We are so blessed to have so many temples. You are so lucky to have one just up the hill. 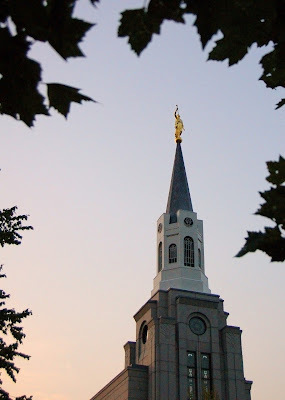 When we lived in Missouri our temple was the Nauvoo temple which was about 2 hours away. We now live in Michigan and it is 45 minutes away and we are so thankful to be that close. What a wonderful time to live on the earth and wittness Heavenly Father's work move forward. We found you through Matt and Heidi's blog! Looks like you're doing well. That is a beautiful temple, and nice pics too. We have some friends living in Boston- I know it's a big city, but do you know Jen and Mike Preece? That is hilarious! I don't live anywhere near Boston, but guess what?? I know Jen and Mike Preece!!! He did intern year with Greg at LDS Hospital!! What a small world...and I love how cute your kids are!